I got word from Vey’s Powersports here in El Cajon, California the other day that 2018 is the final year that Kawasaki is manufacturing and selling the KLR650. Thirty-one years is a long time, especially when you consider how poorly the engine was designed and built for the first seven years. The worst problem was the poorly engineered chain driven balance system which could self destruct and blow the engine. I remember warning KLR owners Kurt G. and Jim B. back in the mid nineties, but before there was a cure both lost their engines two weeks apart. I worked with both Sagebrush Engineering and Eagle Mfg. to solve the problem. Eagle finally built the best “doohickey” with fitment help from me. It took Kawasaki until the 2008 “E” model year to fix the “doohickey” problem, but their 2008 through 2018 “doohickeys” are very strong and can be installed in the earlier model KLR’s. The saddest thing that happened to the KLR650 was the redesign and release of the KL650E model that occurred in 2008. The E model gained weight mostly up front, lost suspension travel, and in general became a street and smooth dirt dual sport instead of the all-around multi-surface motorcycle it could have been. In the event Kawasaki doesn’t replace the KL650E with something lighter and better, you have the option of purchasing a used 1996 through 2007 KL650A and bringing it up to Top Gun specs. Rod Morris, of MMP on this website, and I have several A models and lots of parts for sale. As for the “old” KLR….RIP. We may never see a better multi-surface motorcycle than a properly built and prepped 1996 through 2007 KL650A. By the way the absolute best year for the KLR650 in my opinion was the 1996 model (KL650A10). Ask Rod Morris…he’s got one. My wife Pauline Read, who has logged tens of thousands of tandem multi-surface motorcycling miles on KL650A and DR650SE models set up especially for her, claims to have loved every mile, even the 200 mile dirt days in Baja and the western U.S. 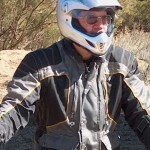 Check out the 3 minute video on this site titled “Pauline’s 89th birthday ride to Cabo” to watch our latest trip to Baja. You may notice that Pauline and I have switched to the Suzuki DR650SE for our multi-surface travels. At our ages (Pauline is 91 and I am 84) the DR650SE is lighter and easier to handle. And yes, we plan to keep on riding for as long as it’s feasible. Prev : Visit Our New Site – eldencarl.com!